Nothing comes close to beating the annual Halloween night tradition of the gigantic people’s Greenwich Village Halloween Parade. The 44th edition of the four-hour “Nation’s most wildly creative public participatory event” kicks off at 7 P.M. from Spring Street, and marches up Sixth Avenue to 16th Street. This year there’ll be a bit of New Orleans’ Mardi Gras spirit with the Grand Marshal’s float, where recording artist Anjelica will reign. Nothing comes close to beating the annual Halloween night tradition of the gigantic people’s Greenwich Village Halloween Parade. The 44th edition of the four-hour “Nation’s most wildly creative public participatory event” kicks off at 7 P.M. from Spring Street, and marches up Sixth Avenue to 16th Street. This year there’ll be a bit of New Orleans’ Mardi Gras spirit with the Grand Marshal’s float, where recording artist Anjelica will reign. Stretching more than a mile, this icon of cultural events gives freedom of expression new definition. Long famous for skewering unpopular trends, personalities, and especially politicians, you can surely expect lots of DJT expository. The event draws 2,000,000 in-person spectators, with more than 60,000 wild ‘n wholly costumed participants, giant puppets, dancers, artists and circus performers, dozens of floats, 50 plus bands, and performing artists. Sponsors include the Village Voice, the NYC Department of Cultural Affairs, Rudin Foundation, and parade-goers like you. Visit www.halloween-nyc.com for information on how to participate. Watch it live on NY1. There’s nothing like a Broadway show for a Halloween treat. About the scariest thing currently on Broadway are the out-in-orbit pricing for Book of Mormon, Hamilton, Hello, Dolly!, and, Bruce Springsteen on Broadway — the show which was supposed to make the Boss available to all. Soon, you can add Frozen and Harry Potter and the Cursed Child – Parts One and Two to the list. Then, there’s the ever-ballooning horror of resale ticket sites. 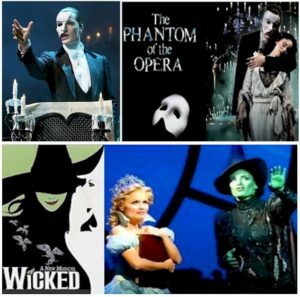 Perfect shows for the season include a visit with that masked lovelorn fellow known as The Phantom of the Opera, Andrew Lloyd Webber and Charles Hart’s Tony-winning blockbuster, which in early 2018 will celebrate 30 years as Broadway’s longest-running show; and Stephen Schwartz’s Tony-nominated Wicked, the tale of the Good and Bad witches of The Wizard of Oz fame, just entering its 15th record-breaking year. 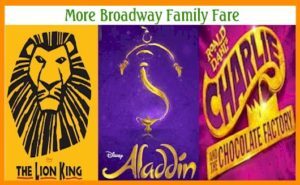 Family-fare includes Disney’s The Lion King, which next month will celebrate its 20 Anniversary; the company’s colorful extravaganza Aladdin; and Charlie and the Chocolate Factory. An adult treat that children aged seven and above will enjoy is Oscar winner Robert Lopez (Frozen), Jeff Marx, and Jeff Whitty’s witty Tony-winning Avenue Q, which just celebrated its ninth year Off Broadway (after six hit years on the Main Stem). All For One Theater’s is presenting the psychological horror play Squeamish, by and directed by Aaron Mark (Empanada Loca) and starring two-time Tony nominee Alison Fraser (The Secret Garden, First Daughter Suite),at Theatre Row’s Beckett Theatre. It’s the tale of an Upper West Side psychoanalyst, a long-time recovering alcoholic, “whose bloody quest for personal balance begins when she finds herself off her meds in South Texas, following the suicide of her nephew. Tickets for the limited engagement (through November 11) are $52.25 and available at www.telecharge.com or by calling (212) 239-6200. Beginning performances November 16 at 59E59 for a limited engagement (through December 10) is Adjusted Realists’ production of Stephen Kaliski’s The Briefly Dead, which finally answers the question of whether you can bring the love of your life back from the dead. Bad news: in the tradition of ancient Greek theater, King Admetus of Thessaly learns that the unexpected resurrection of his wife, Queen Alcestis, who personified the devoted, selfless woman, leads to a really awkward breakfast. She has a big score to settle. Elizabeth Ostler directs a quirky mix of shadow puppets and actors: Mia Isabella Aguirre, Sofiya Cheyenne, Kristin Fulton, Paul Hinkes, Ben Kaufman, Katie Proulx, Sarah Wadsley, and Jenna Zafiropoulos. No performances November 22 and 23. Tickets are $25 ($20 for 59E59 members). 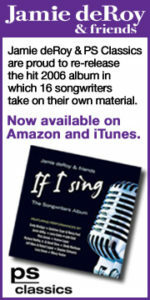 To purchase, call Ticket Central (212) 279-4200 or visit www.59e59.org. Ready for more Games of Thrones? Off Broadway has them. After rave reviews and sold out performances, GOT The Musical’s Off Broadway’s Game of Thrones: The Rock Musical – An Unauthorized Parody [of HBO’s smash hit fantasy series of dragons, dwarfs, and danger] is extending through December 30th at the Theater Center (210 West 50th Street). But there’s a change. The extension has a new title: Shame of Thrones. It has all the elements: evil prince, backstabbing siblings, a stalwart hero, a hysterical imp, the mother of all dragons – and, of course, a rock score “that’ll have heads rolling.” You can re-visit all your favorite characters and the ones you love to hate. For tickets ($57, $67, and VIP $123) and more information, visit www.ShameofThronesMusical.com. The new schedule includes naughty “after-dark” performances (code for more raunch, vulgarity, and adult-themed comedy) Fridays and Saturdays at 10:30 P.M. and a “Red-Wedding” matinee (with half priced Bloody Marys) Sundays at 1 P.M.
Write Act Repertory and Tamra Pica are presenting the world premiere of Eric B. Sirota’s Frankenstein: The Musical, based on Mary Shelley’s novel “about the human need for love and companionship.” WAR producing artistic director John Lant (production manager, Carnegie Hall) describes the show as “two-act sweeping, romantic musical that honors its source material.” Clint Hromsco directs Danny Bristoll, Jonathan Cobrda, Amy Londyn, Charles Baran, Benjamin M. Haupt, Cait Kiley, and Gabriella Marzetta. Music direction and arrangements are by Anessa Marie. Performances are Mondays at 7:30 P.M., through December 18, at St. Luke’s Theatre (308 West 46th Street, between Eight and Ninth Avenues, Restaurant Row). St. Luke’s is NYC’s busiest rep house. Among productions onstage are the family-friendly The Lion, the Witch and the Wardrobe Saturdays at 11 A.M., adapted by le Clanché du Rand from the C.S. Lewis’ classic novel. 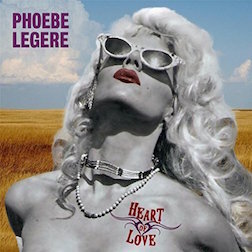 Tuesdays at 7 P.M. (through December 31), there’s Michael Antin’s direct-from-Los Angeles [where it won several awards] love musical Lili Marlene, the story of cabaret chanteuse Rosie Penn and Count Hans Wilhelm van Kleister Graff, set at the end of the Weimar German Republic and beginning of the Third Reich. Amy Londyn headlines the 14-member cast. Direction and choreography are by Mark Blowers, with musical direction by Rocco Vitacco. Five times weekly, there’s Lynn Shore Entertainment and Medium Face Entertainment’s production of Friends: The Musical – The Unauthorized Parody of the Hit TV Show, by Bob and Tobly McSmith (Saved by the Bell, Full House parodies) and Assaf Gleizner and directed and choreographed by Paul Stancato. Vital Theatre Company (recipient of Off-Broadway Alliance Awards) presents Peter Charles Morris (co-author, co-lyricist, Howard Crabtree’s Whoop-Dee- Doo!) and David Mallamud’s new, family-friendly (but not so much from Mary Shelley’s source material) Kid Frankenstein, for ages seven and up – but not too far up. It’s Halloween and something strange is going on at Frankie Steiner’s house, where the boy genius works on his entry for his school’s robotics competition. But what he creates is more than he expected – and more than he can handle. That last part, a unique and certainly unexpected twist, is what makes this not exceedingly deep show fun (and will garner laughs from accompanying parents). The cast – Nicholas Carroll, Amber Dickenson, Seth Hatch, Matthew Krob, Jocelyn Lonquist, and, as Frankie, a spirited Stephen Wagner – gives their all, but the over-amplified canned music, sadly all sounding the same, does them in. 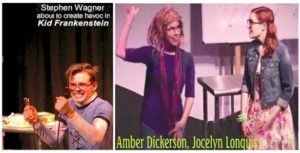 However, without giving anything away, be advised to keep a keen eye on Dickenson, who has some tricks and treats up her sleeve: and beguiling Lonquist, it would seem, is destined for bigger things. Performances at the Theater at Blessed Sacrament (152 West 71st Street, east of Broadway) are Fridays at 7 P.M., Saturdays and Sundays at 3 and 7 P.M. through November 5th. 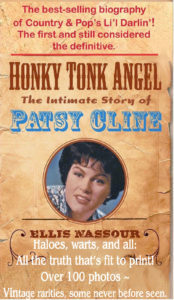 Purchase tickets, $25.00 to $59.50, at www.vitaltheatre.org or call (212) 579-0528. Also playing at Blessed Sacrament are: Pinkalicious: The Musical, about a gal who just can’t say no to eating pink cupcakes, despite parental warnings – a habit that lands her in hospital with Pinkititis, an affliction that turns her pink from head to toe. In addition, there’s the one-hour adaptation (from London’s Royal Shakespeare Company) of Arlen and Harburg’s The Wizard of Oz, courtesy of L. Frank Baum, tailored for audiences two – seven. Check above website for schedules and tickets. Too bad Mary Shelley’s not around to bask in her royalties. Ensemble for the Romantic Century will present Frankenstein December 21 – January 7 at the Pershing Square Signature Center/Irene Diamond Stage (480 West 42nd Street). Starring will be, get this!, Tony-nominee Robert Fairchild (An American in Paris), who’ll also choreograph. Donald Sanders will direct. The site, www.romanticcentury.org, will, hopefully, have ticket information up soon.